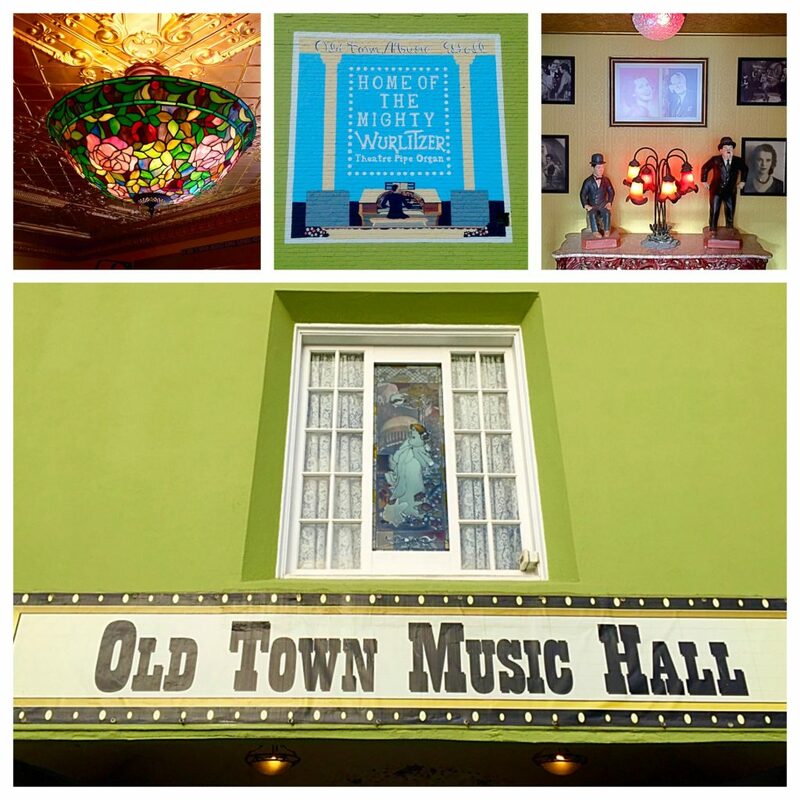 El Segundo is home to a little gem of a place called Old Town Music Hall. 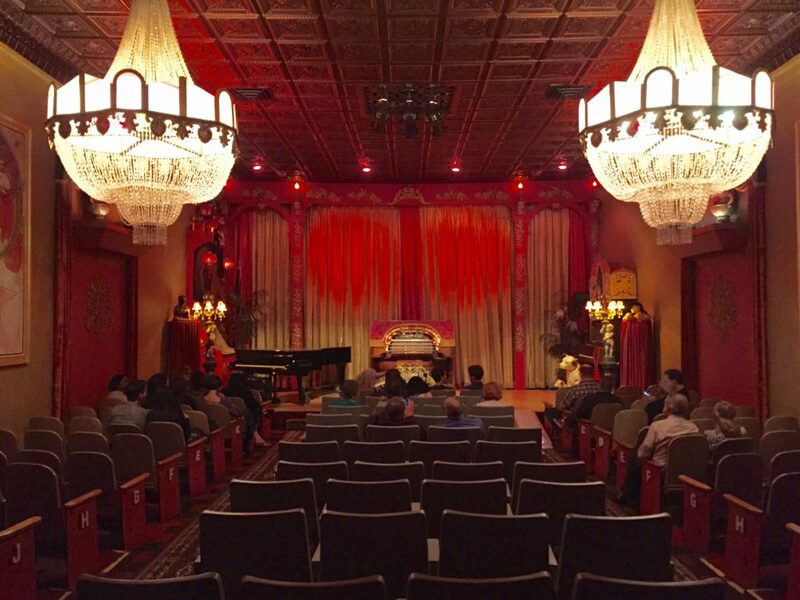 This magical space transports you back in time to the good ol’ days when people flocked to theaters to watch silent movies accompanied by live music and perfected their singing prowess with sing-a-longs. A concession stand outside sells popcorn and goodies and as soon as you enter the theater, you know you are somewhere special. From the intricate faux tin ceiling to the two sprawling chandeliers to the unique artwork, the theater is truly a feast for the eyes. The centerpiece of course is the Wurlitzer console but you know that something even grander hides behind the lush drapery that hangs from the red and gold proscenium. The evening was hosted by Atlas Obscura (http://www.atlasobscura.com), the “definitive guide to the world’s wondrous and curious places.” The Atlas Obscura community discovers thrilling and intriguing locales and the public are invited to explore these hidden places with small groups. The owner of the Wurlitzer, Bill Field, started his musical journey at a young age playing the piano. His grandmother would take him to Barker Brothers furniture store in downtown Los Angeles that housed an organ in the lobby. Passing by the building nearly everyday, Bill’s affinity for the piano quickly translated to a love of pipe organs. 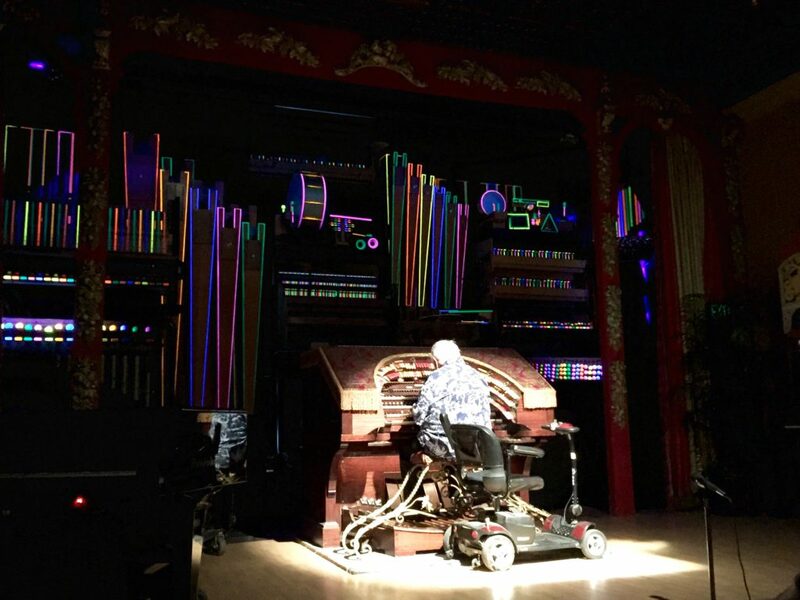 Bill enrolled in lessons where he learned by ear and memorization and thus was the start of his musical journey that led to a decades-long career as an organist. 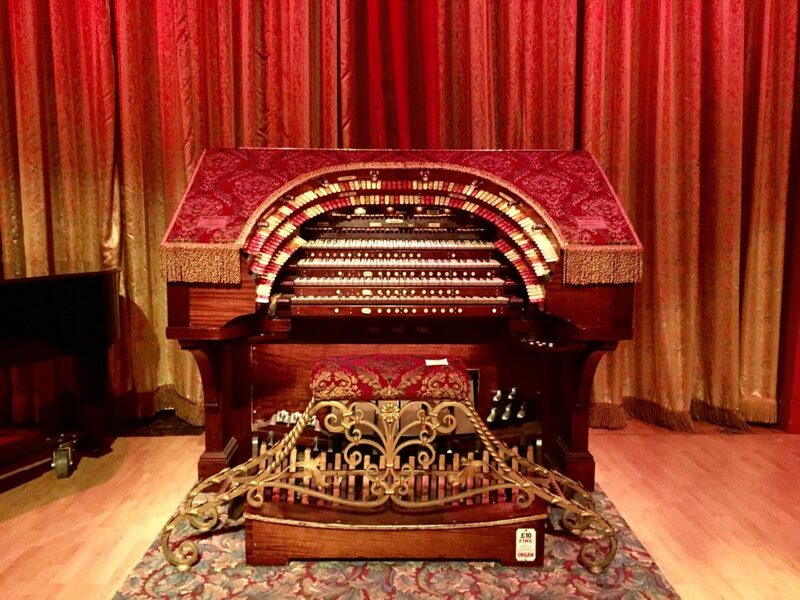 In 1968, Bill and his friend and fellow musician Bill Coffmann purchased The Mighty Wurlitzer from the Fox Theater in Long Beach. The theater chain was ridding itself of all live instruments and the Long Beach location’s organ was the most intact of the lot. Fortunately for the “two Bills,” they had the assistance of two men who worked for the Wurlitzer company to help assemble and restore the 2,600-pipe organ. To house this substantial instrument they rented El Segundo State Theater, an old silent movie theater built in 1921, and The Old Town Music Hall was born. After Bill told us about the history of the theater and the Wurlitzer, he opened the stage for questions. Bill was so generous with his time and answered every question with a considerable amount of thought. 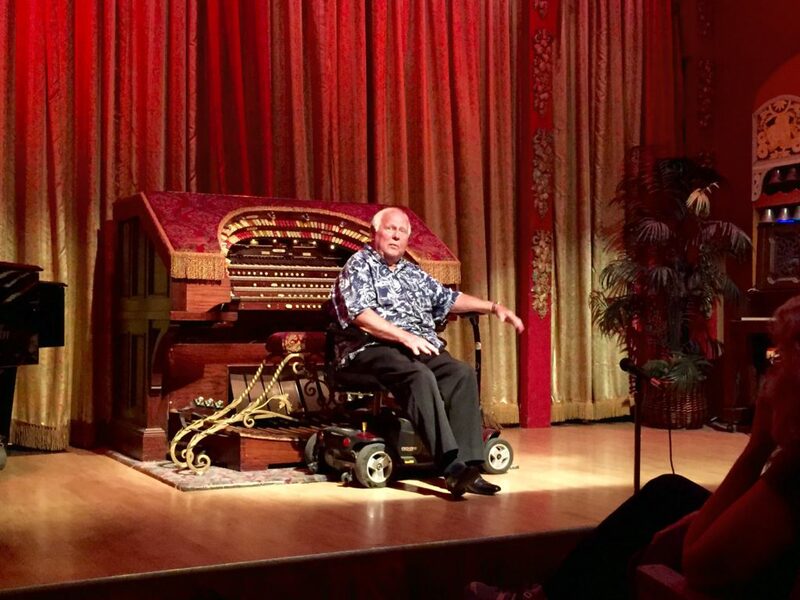 It is clear that this man loves sharing the history and music of the Wurlitzer with so many. 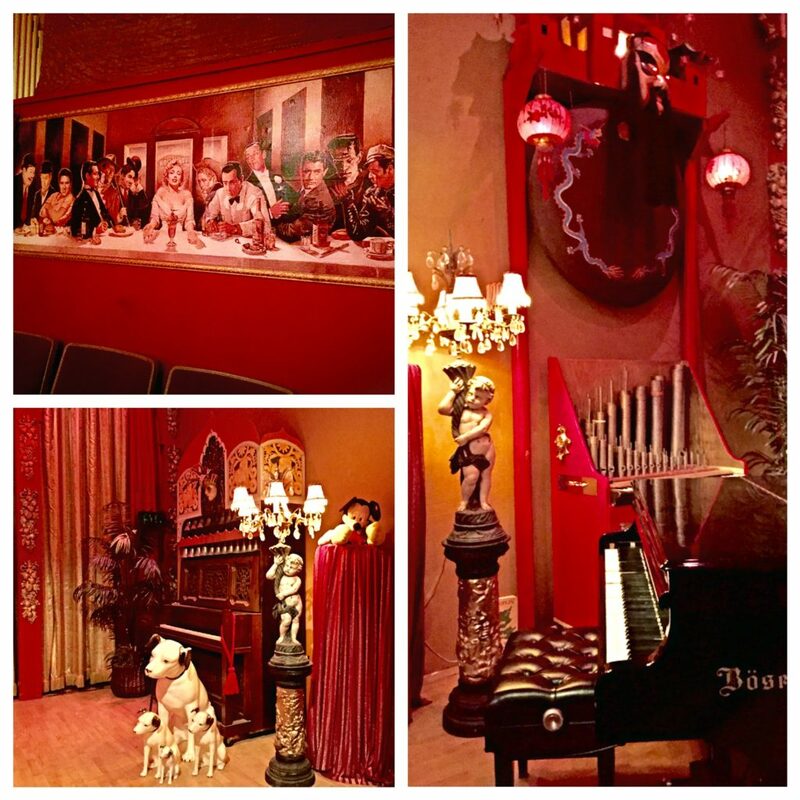 He explained how he acquired nearly every single instrument and decoration in the theater, from the gong to the 92-note Bösendorfer grand piano to the artwork. The real treat was when the curtains were drawn to reveal the pipes of the Wurlitzer. 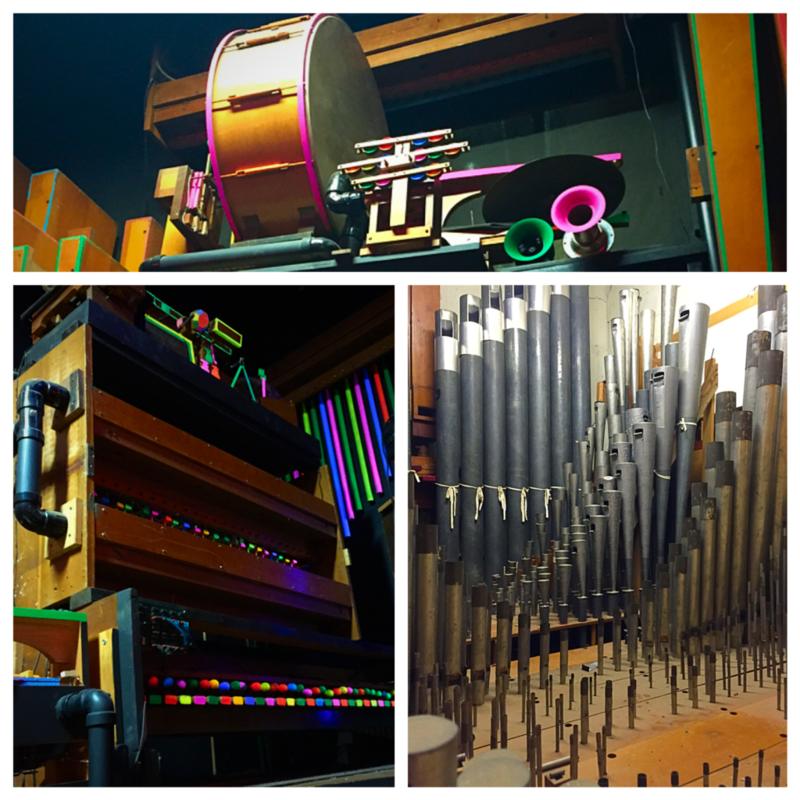 Decorated with colorful paint and highlighted with black lighting, the pipes of the Wurlitzer truly glowed. Bill took his place at the console and played a short concert of pieces that highlighted various sections of the organ. The evening wouldn’t have been complete without a sing-a-long and a silent movie too (a comedy!). Bells, drums, cymbals, marimba, xylophone, and even the gong provided a feast for the eyes as well as the ears. Bill played as he has done for years and made it look effortless. It was amazing to see so many elements playing at once knowing that he was controlling all of it. Talk about multi-tasking! A unique part of the Atlas Obscura event came after the performance when we were allowed the go backstage and examine the inner workings of the pipe organ. Small groups were invited to visit the basement that houses the 10-horsepower Spencer Turbine Orgoblo that supplies air to every aspect of the instrument. 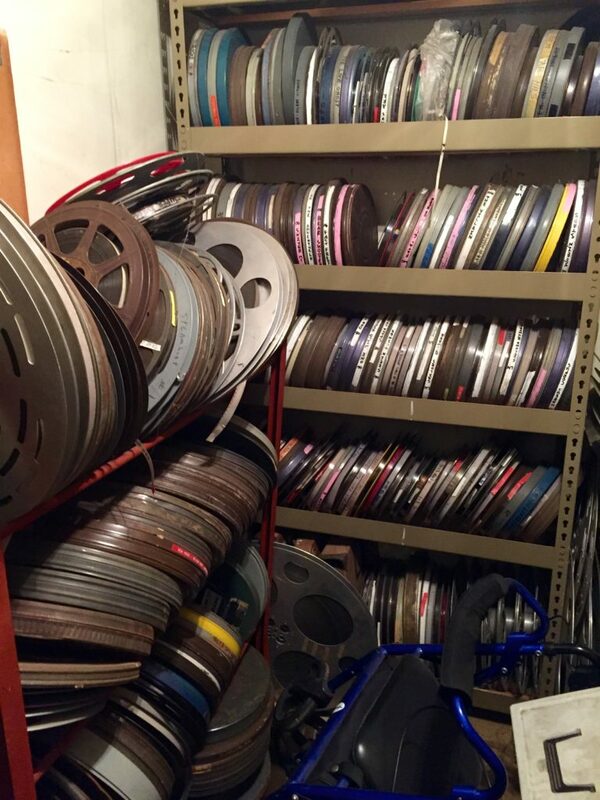 A special surprise also awaited around the corner where a room was full of canisters of film! They are in the process of digitizing all the material before it disintegrates but it was so neat to see the films in their original form. The most exciting part was actually entering the organ to see the pipes. In groups of 2 and 3, we were invited to take a look at the pipe chambers. From some no bigger than a matchstick to some several feet tall, it was incredible to see the scope of The Mighty Wurlitzer! Bill graciously answered any and all questions and he even gave a brief lesson as to how the four keyboard console, 260 switches, and controls and pedals function. The Old Town Music Hall hosts concerts, movies, and various performances throughout the year. The hall is a non-profit organization and depends upon tickets sale and contributions to maintain their operations. Help keep this historic site and the incredible music available for years to come! To visit or to attend an event, visit http://www.oldtownmusichall.org for more information. « I Won the Lottery! We were into that theatre many years earlier.